Hey, everyone! Welcome back to basketball season. If you were around these parts last year, you remember our weekly feature: This Week in Hoops. It’s changed a bit, but the essence is the same. If you’re new to Palestra Back, TWIH is a helpful guide to the recent goings on in the world of basketball. If something happens on the hardwood, you’ll hear about it here. Duke guard Grayson Allen beat the buzzer with a little floater to top highly ranked Virginia yesterday. I mean, his shot did beat the buzzer, but there was a lot going on with his feet. Watching live, I couldn’t believe the officials missed him travelling. Upon an embarrassing number of views of the replay, he not only takes three steps before the act of shooting, but lands back on the ground before releasing the ball. The controversy and reaction to this play has been two-fold. First, any three refs capable of doing this game should see at least one of those calls. This was not one toe out of place. He takes four steps before the ball leaves his finger tips. Watching it in real time, it’s obvious. Watching in slow motion, its almost laughable. It’s not a call that should be missed. Some (Duke fans) have argued that Marial Shayock fouled Allen. I don’t think he did, but I’d rather a foul be called than nothing. At least that is a judgment call. This was a yes or no that three ACC officials flat-out missed. But somehow, this was not the biggest problem. The narrative on Twitter and in the media shifted in the moments and hours following the game. Don't need to dissect the Allen shot like the Zapruder film to see it was a travel. Will never get called in Cameron. It's not just Cameron in my mind. Refs aren't making a last-second call that favors the road team in 90% of high-major gyms. Three refs missing a call that affects an important game is a bad look. 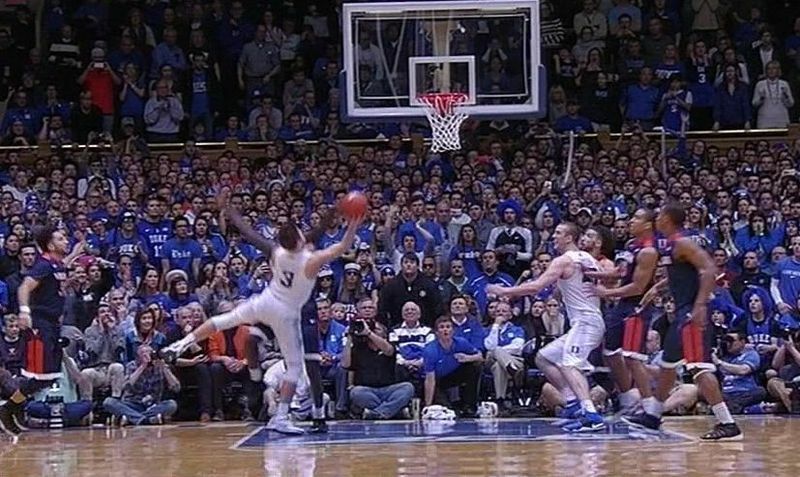 Virginia’s chances at a number one seed took a hit because of this missed call. But a systemic issue of officials afraid to make a call in the closing seconds of the game is far worse. People who talk about refs “swallowing the whistles” on a game deciding possession will always talk about letting the players on the court win or lose the game. In most cases, that means not calling a ticky-tack foul. In this case, the players did decide. Shayock forced Allen into a turnover, but he got away with it. If he did so because of the pressure of reffing in Cameron or in a game of this magnitude, the refs on the court for the game should be held accountable. Officials will always represent a human element of the game, but injecting bias or emotion into their role is worse than simply making mistakes. Nothing will likely happen to these refs. Nothing ever does. NCAA officiating is a mess. The supposed experts of the game asked for rule changes and they continue to demand more, though so many of college basketball’s issues could be alleviated by more consistent refereeing. Officials, right now, are essentially independent contractors. They work as many games in a week as they want. They travel from time zone to time zone, conference to conference, with little to no evaluation affecting their stature or position. NBA refs, for whatever flaws they have, are held accountable. Their performance is graded, rated, published, and used to determine their fate. Until the NCAA formalizes their officials and provides a higher level of scrutiny, we’ll continue see problems, from missed calls to the more serious systemic tendencies and predicaments. Barack Obama’s attachment to basketball has been trumpted since 2007, but I haven’t seen him hit a jumper since at least 2010. Meanwhile, BERNIE GETS BUCKETS. FUNDAMENTALS! Meanwhile, Louisville’s Strength and Conditioning Coach was revealed to be a psycho, as is tradition for Strength and Conditioning Coaches. More from me, at Rush The Court: Villanova is finding success via its lesser known players. Big week for basketball reading, especially thanks to TrueHoop taking over ESPN’s NBA coverage. That included a study of the fatigue NBA players experience due to the 82 game schedule, investigating Steph Curry’s recovery from his ankle troubles, a profile of Jahlil Okafor, and a cool look into a new age statistic called “gravity”. All are definitely worth your time, especially the Curry piece by Pablo Torre. Back at my second home, Rush the Court, Greg Mitchell showcased Tyler Ulis’ defensive prowess. SBNation’s Ricky O’Donnell detailed how, despite cold shooting, North Carolina is still a championship contender. If you’ve been casually following college basketball so far, SBNation also has a nice guide to catch you up. Even if you’ve been tuned in, it’s pretty fun. Lastly, this is just a tweet, but former Grantlander Mark Titus with a handy reminder about which teams could be on the short list to win this year championship, based on recent history. 2003 Syracuse is only national champ in KenPom history w/o future NBA guard. 2009 UNC had 21st-best KenPom D – only champ not in top 20. May the Tuesday Top Tens rest in pieces. Long live Rank Shots! If you’re not familiar, this is where we rank the best teams in the NBA, college basketball, and rank another totally irrelevant something. I can’t say whether my loves of sports and writing outdate my love of Springsteen music, but like every other person who has ever written about sports ever, I love The Boss. I was lucky enough to see Bruce and the E Street Band live last week, so this seems like the perfect time to rank essentially every Springsteen song worth listening to. UPDATE: This list is now available as a Spotify playlist, which can be found right here. Fun Big XII doubleheader right there. Now they have a rematch at 10 PM local time. Things will get fiesty!